Officially the Baseline Trail is a loop that is accessed via the Gila Trail loop. 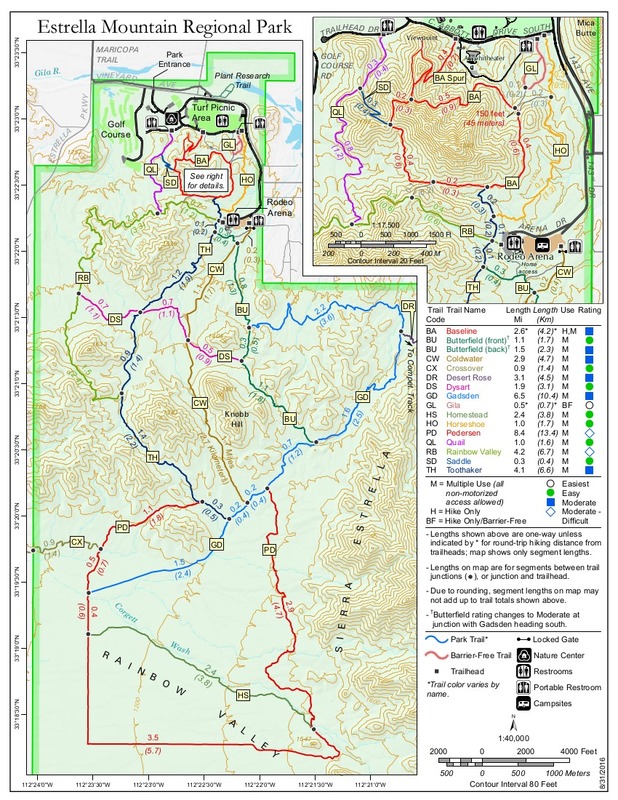 The two combined offer a 2.3 mile figure-eight loop hike presented here. The hike is relatively low key in elevation change with just enough to keep you looking ahead. From the trailhead head out on the Gila Trail which is barrier-free. This is like the first part of the popular Waterfall Trail in the White Tanks. Meaning it's wheelchair/stroller friendly, designed to comply within ADA guidelines. It's also interpretive with a few benches along the way, including a shaded bench at the Baseline junction. Once on the Baseline Trail you circle one of the lowest lying peaks in the Estrella foothills. The figure-eight loop is separate from the main group of trails in the park. This appears to be an area previously criss-crossed with numerous trails. The park obviously wanted to keep foot traffic in line by creating this loop. With that in mind there is no access to the main trail system from this loop. The tread is pretty easy for the most part. One short lived steep section through a ravine will get your attention. Which is followed with a few minor gravely sections. The views along the hike are fair at best. A clockwise trek will present a backside view of the Phoenix International Raceway grandstand followed by a distant view of Rock Knob. Then you bring it home overlooking a golf course followed by views of what the park calls the "Turf Area". An early morning sunrise or a late afternoon sunset would certainly spice things up. Creosote bush and staghorn cholla seems to be the predominate vegetation with some nice ironwoods and palo verdes along the way. Baseline is derived from the Gila and Salt River Base Line. Which, yes, is in line with Baseline Road and would plow right smack through this loop hike. Of more interest, to me at least, is the confluence of the Agua Fria and Gila rivers. It's only 0.6 miles NE of the trailhead. Of course the bastards dammed the Gila near South Butte. Wild mustangs likely inhabited the area long ago in what was once a thriving riparian oasis. Anyhow... This is a good loop for those in search of a shorter hike in the park. Just don't come here expecting much and leave feeling robbed due to the access fee. This isn't the Sierra Estrella mountain range the valley views from afar. This is the upper low lying foothills. 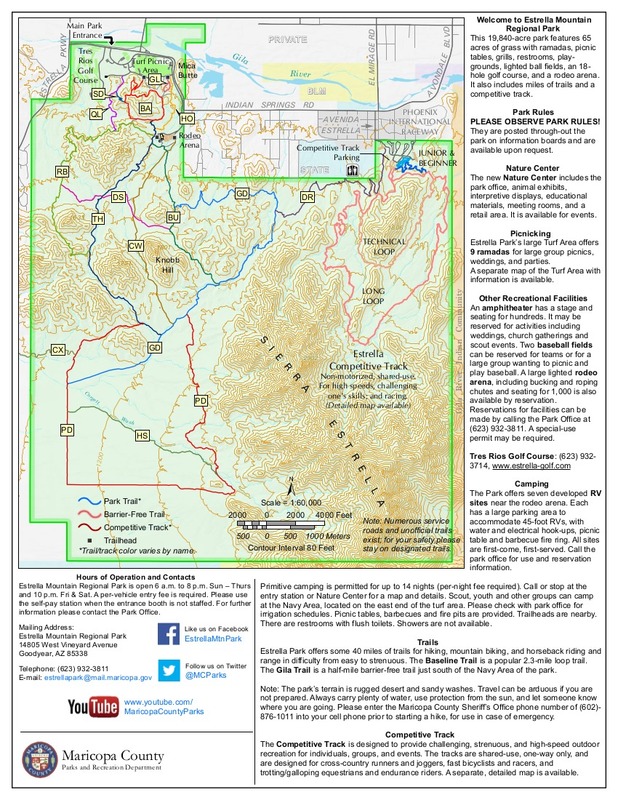 The majority of the main range is on the Gila River Indian Reservation which is off limits. The one sliver of access is the Quartz Ridge Trail. It's out in the middle of nowhere, but it's free and awesome! From central Phoenix head west on I-10 towards California. Take the Estrella Parkway exit and head south. Continue about four miles or so to West Vineyard Avenue. Turn left on Vineyard, you'll pass a golf course. Keep your eyes peeled for the right turn into the park soon after the golf course. Once in the park, pay the entrance fee and pick up a free map. 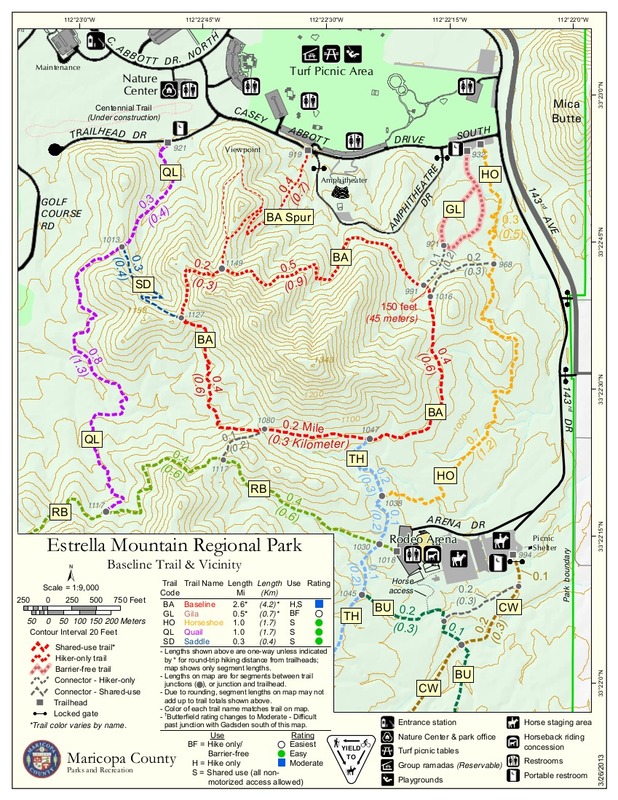 The map will help you find your way to the trailhead.